Growing optimization of yield with increase in demand for superior quality crop will drive agricultural films market size in future. Industry growth will be driven by durability and transparency, which are key performance metrics. Ultra-thermic, ultra-violet blocking and Near Infrared (NIR) blocking are some of the key innovations. Global agricultural films industry share will be driven by limited arable land availability with occurrence of natural disasters. Additionally, an increase in the population base with rise in superior food quality demands will further complement the industry. These products not only increase the crop quality but enhance the yield. The United Nations has estimated that the global population was 7 billion in 2012 and is expected to exceed 7.2 billion by 2015. Also, the total availability of arable land has reduced from 55% in 2000 to 45% in 2015, which was especially evident in Europe. Scarcity of arable land is anticipated to drive the market size in near terms. Food production index is a mix of edible and nutrients. Threat towards crop damage from insects and limited availability of arable land encourage farmers to adopt mulching practice which may compliment the market in coming years. Sustainable Agriculture Network (SAN) and Alliance for a Green Revolution in Africa (AGRA) has introduced training programs for farmers to encourage implementation of new farm techniques which may boost the crop yield. Polyethylene films pose to be an environmental threat, as they are derived from petrochemical sources and are non-biodegradable in nature. Growth possibilities for new industry players in the business is technology innovation. The key trend would be to manufacture products which are biodegradable in nature, and made from plant extract. Linear low-density polyethylene holds the dominant agricultural films market share with a valuation of over USD 3 billion in 2014. Enhanced shelf life coupled with high tensile strength are key performance indicators which may favour the industry. China, India, Thailand and Indonesia are highest consumers subject to inadequate water supply and changing weather conditions in the region. 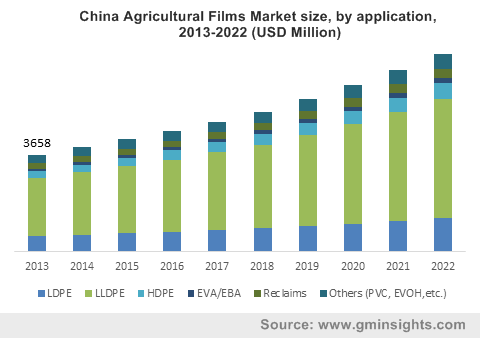 Agricultural films market from munching applications was valued over USD 2 billion in 2014 and is anticipated to witness a significant growth owing to is limited usage of water coupled with crop protection from insects. Greenhouse applications account for over 40% of the total volume in 2014 and is most likely to grow over 6% by 2022. China market size was valued over USD 3 billion in 2014 and is expected to witness a handsome growth during forecast period. Favourable government regulations towards advanced farming techniques may further complement the industry outlook. Mulching applications are widely adopted owing to its moisture retention properties. Middle East and Africa led by Saudi Arabia and South Arica accounted for major proportion of the total demand in the region. Scarcity of fertile land coupled with growth in food demand subject to growing population base may propel the business growth. Global agricultural films market is extremely fragmented. It is characterized by SME’s in India, Malaysia, Thailand and China. British Polymer Industries was one of the dominant industry participants of 2015. Other key industry participants include Trioplast, Group Barbier, Kuraray, Novamont, ExxonMobil, BASF, Armando Alvarez and Britton Group. The global agricultural films industry is being driven by technological progress and innovation. Key companies in this business have made investments in research and development of new technology. BASF one of the key business player, has recently released a new line of affordable and biodegradable products which improve yield and compost quality.